It’s a multi-use stadium now. We can use it for a lot of different events and not worry about the wear and tear of a grass field. The Shaw Sports Turf field is going to be a time-saver for me and for our staff. During his 25 years as a coach at Fulton High School in Knoxville, Rob Black has always wanted a synthetic turf field. Now, his team is hosting summer workouts on an all-new Shaw Sports Turf field. Last week, the Fulton Falcons went to work on the new surface, which features Shaw Sports Turf’s Legion system. The Falcons are looking to get back to the top spot in Tennessee high school football, a spot they have held six times since 2003, including three consecutive titles from 2012-2014. The Legion system from Shaw Sports Turf is a combination of high-performance monofilament fibers and a durable slit film fiber. The slit film fiber is a workhorse that will handle the workload, while the monofilament provides a more resilient surface that enhances performance characteristics. 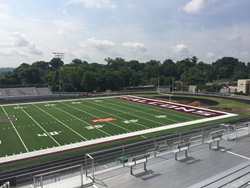 The new surface at Fulton High School has been part of a larger project involving the fields at all 13 public high schools in the Knox County school system. The Haslam Family Foundation and Pilot Flying J are providing $8.7 million for the fields and tracks at some of the schools. They are also providing an additional $1.3 million, which will be earmarked for academic programs at each of the 13 schools in the amount of $100,000 each. Baseline Sports Construction of Knoxville was selected as the contractor for the fields. Baseline is a full service recreational contracting company that has served the Southeast since 1982. The first game will be an emotional one for the Falcons. In December 2015, sophomore linebacker Zaevion Dobson was visiting with friends when gunfire erupted. Dobson dove on his three female friends to shield them from danger. None of the girls were injured, but Dobson lost his life in the random act of violence. The school has honored Dobson by placing a replica of his jersey in the playing surface. “The kid was a hero and somebody that we’re proud of and proud of the act that he performed and being able to honor him on our field,” said Black. The community has rallied around the school and Dobson's family. In a way, the new field means as much to the community as it does to the school. While the football team will take center stage, but Coach Black is excited about the additional community events and school activities they will be able to host on the field. "Fulton has a proud athletic tradition," said Jimmy Marshall, Territory Manager for Shaw Sports Turf. "We are proud to be able to help them move the program forward and continue to achieve their goals." The home opener will take place when Fulton host Maryville in the Pilot Battle of Champions, which will be played on Saturday, August 27. The game will be broadcast live on WVLT (CBS) and online at http://www.rivalrythursday.com.